D&R Masonry Restoration does work all over our beautiful home state of Oregon, including The Dalles and Hood River. We are proud to keep historic buildings in beautiful condition while giving new properties durability measures for the future. As two historic Oregon cities, Hood River and The Dalles, OR are classic examples of beautiful Masonry from over a century ago. With the intense weather that travels west thought the Gorge Area, D&R Masonry Restoration’s waterproofing services can keep your location dry and protected from damage. Above & Below Grade Waterproofing – We’ve done large scale waterproofing for commercial buildings and structures, including Hood River properties. Hot Waterproofing – D&R Masonry Restoration offers rubberized asphalt waterproofing to give your flat surface an even, level coating that will protect against damage. It can be applied in one smooth layer for a durable barrier. Exterior Coatings – Exterior coatings are a dual-purpose service. We help you’re The Dalles, OR building stay free from dangerous water damage while also providing a protective layer to keep it in excellent condition for years. Caulking – Caulking is typically unnoticeable, but if yours starts crumbling and allowing water in, you’ll definitely notice! Our crews can patch up your old caulking or give you a fresh start. We know the techniques to get a great application that will last. Parking Deck Repairs & Coatings – Parking deck coatings add tremendous strength and protection for your Hood River parking site. D&R Masonry Restoration has trained craftsmen who can do the job while carefully managing time for the least inconvenience possible. Grout & Epoxy Injection – If you want to prevent water, snow, and ice damage from entering through cracks, spalls, and gaps that your building already possesses, try grout and epoxy injection. We can use injection to put preventative measures exactly where you want them. Tuck-pointing & Brick Replacement – If you want to refresh your Dalles, Oregon property, brick replacement and tuck-pointing can be some of the best ways to do it. We match your pre-existing colors with bricks from our “bone pile” and mortar. This keeps your structure looking new while retaining its unique charm and originality. Expansion Joint Systems - Expansion joint systems grant your site materials movement during all types of weather. When they expand in the heat, your system will shrink to make room without leaving faulty gaps. If your property shrinks in the cold, the system expands to create a tight space. Expansion joint systems can also help with wind and seismic issues. Masonry Restoration – We can apply our years of experience to you’re The Dalles masonry restoration project for the best results. Our crews take the time to understand the specific needs of your building before creating customized plans made especially for you. Air Barriers – Choose our air barriers in The Dalles. They control air flow and water vapor and give you more consistent heating and cooling. D&R Masonry Restoration can do any exterior services a building could require, from cleaning to coatings. 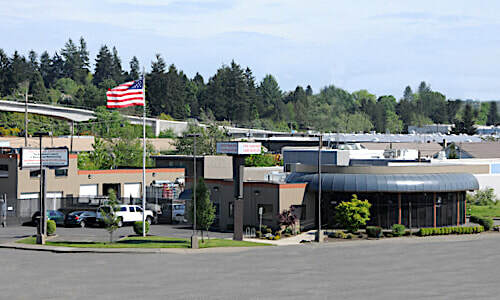 Let us take care of the needs of your Hood River commercial property! Exterior Cleaning – Exterior cleaning is important for any building whether it’s a large university or a small commercial building. We offer a variety of options to choose from including chemical treatments to offset growth or pressure washing to blow away stains. Graffiti Removal – While Hood River is proud to allow some legal graffiti, illegal vandalism should be removed quickly and effectively without damaging the surface behind it – D&R Masonry Restoration can take care of graffiti removal services for Hood River, OR and White Salmon, WA. Terra Cotta Repair/Replacement – We can take your terra cotta up a notch with skillful repairs and replacement. Façade Stabilization – D&R Masonry Restoration can design and install lasting support between your veneer and your structural wall. This is important not just for general structural safety but to prevent frustrating water damage. We can fix deteriorating ties or install new anchors, whatever you need! Traffic & Pedestrian Deck Coatings – Traffic and pedestrian coatings protect your Hood River, Oregon deck while also helping your customers. They are skid-resistant and prevent unsightly and unsafe damage from gas, oil, deicing salts, wear and tear, and more. Concrete Repair – Our team can repair your concrete so it looks good as new! Whether that means dealing with spalls or patching up gaps, D&R Masonry Restoration is the only concrete expert you’ll need to call. Floor Joint Fillers & Repairs – Floor joint fillers allow for level concrete flooring that can handle pressure and movement between slabs. If your old joint fillers need replacement or repair, we can do that with skill. Or, we can put in completely new ones to suit your current Hood River space. WHERE ELSE CAN D&R MASONRY RESTORATION HELP? D&R Masonry Restoration proudly offers our quality restoration, waterproofing, coating, cleaning, repairs, and masonry services all across the Pacific Northwest including Oregon, Washington, Idaho, and Montana. Our crews head as far north as Seattle and Bellingham, WA, south to the Oregon – California border and we take on projects anywhere in Montana and Idaho. Whether you need waterproofing in The Dalles, masonry revitalization in Hood River, exterior masonry services in Goldendale, or commercial masonry care in Bend, we bring exceptional service and the highest quality work to every customer and every project! ​CALL D&R MASONRY RESTORATION TODAY AT 503-353-1650!